If you are planning a large holiday or special celebration dinner or brunch, here's a recipe for Strawberry Shortcakes that will make a wonderful dessert for a large amount of people. In food processor, process almonds until finely ground. In mixer bowl fitted with paddle attachment, combine almonds, flour, salt, 5 ounces of the sugar and baking powder. Add butter; mix on low speed until butter is the size of small peas. Slowly add 2 cups of the cream, mixing until dough just comes together. On lightly floured work surface, roll half of the dough to 3/4-inch thickness. Using a 3-inch biscuit cutter, cut twelve shortcakes. Repeat with remaining dough. Brush tops with remaining 1/2 cup cream; sprinkle with remaining 4 ounces sugar. Bake on ungreased cookie sheet in preheated 350ºF (180ºC) oven for 25 to 30 minutes or until golden brown. In a large stainless steel bowl, whisk together egg yolks, eggs and 1 pound of the sugar. Stir in lemon juice. Place bowl over a pot of simmering water; stir constantly with rubber spatula until mixture begins to thicken. Switching to a wire whisk, cook 5 minutes or until thickened. Strain through fine strainer into non-reactive container; cover surface directly with plastic wrap. Chill completely. In mixer bowl fitted with whip attachment, beat cream and remaining 6 ounces sugar to soft peaks. Fold in chilled lemon cream. Cover and chill until ready to serve. Makes about 12 cups lemon cream. Warm 1 shortcake in oven. Toss 3 ounces strawberries with sugar, as needed. Spoon 1/2 cup Lemon Cream over shortcake. 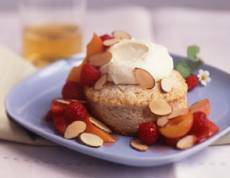 Top with 1 tablespoon toasted almonds and sweetened strawberries. Garnish with 1 tablespoon toasted almonds.